Hitch Rider Double Decker Rack for tadpole trikes. 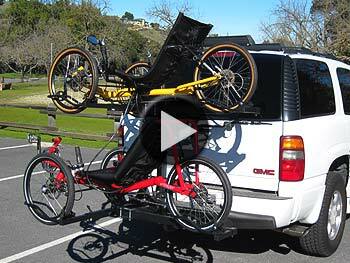 Transporting two tadpole-style recumbent trikes is easy with our Double Decker™ trike hitch rack. The rack fits both 1 1/4" and 2" receiver hitches. Trike carrier is adjustable for length, width, and load centering. Rack carries tadpole style recumbent trikes up to 50 lbs. on the top position and most trikes up to 70 lbs. on bottom position. View rack specifications. Wider wheel holders fit tires up to 3" wide. Longer 11 hole wheel straps are required for tires more than 2.5" wide. Rack tilts for vehicle access and folds up close to vehicle when not loaded. Top trike carrier can be removed. Rack add-ons are available to upgrade rack. Rack includes threaded hitch pin (Hitch-Vise not required), rack stabilizer strap, 1 1/4" solid hitch bar, and 2" hitch adapter (patented). Locking hitch pin and security cable are available. Rack add-ons and conversions available for this rack.